A 43-year-old woman with acute vision loss and eye pain. No prior neurologic symptoms were noted. Axial, short tau inversion recovery (STIR) image demonstrates faint increased signal in the distal left optic nerve. A 35-year-old woman with acute onset of left-eye pain and vision decline. 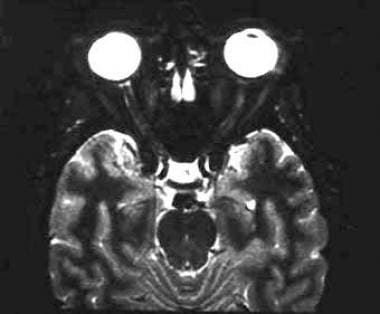 Axial, fat-suppressed, postcontrast, T1-weighted image demonstrates enhancement in the intracanalicular portion of the left optic nerve. Thin (2-3mm), fat-suppressed, T2-weighted images, such as short tau inversion recovery (STIR) sequences, through the optic nerves may show characteristic high-signal intensity foci in the minimally expanded or nonexpanded nerve. These lesions frequently enhance following intravenous contrast administration, which is not seen in a healthy optic nerve. Some studies have shown that certain findings, such as optic nerve lesions of greater length and in certain locations (within the optic canal), may be associated with a worse visual prognosis and may benefit from certain treatments, but other studies have not supported this conclusion. Diffusion-weighted and diffusion-tensor imaging may contribute more data that may prove to have some bearing on treatment and/or on prognosis. [15, 16, 17, 18] The thought is that the loss of anisotropy (manifested by an increase in the apparent diffusion coefficient or a decrease in fractional anisotropy) associated with demyelination and/or axonal damage may be more sensitive and/or yield more prognostic information than anatomic imaging findings (size, T2 signal intensity, and enhancement, which suggests loss of the blood-brain barrier due to the underlying pathologic process), which could manifest themselves much later than the findings associated with loss of anisotropy. However, with the current technology, diffusion-weighted and diffusion-tensor imaging of the optic nerves is too time- and labor-intensive for broad clinical application. A 43-year-old woman with acute vision loss and eye pain. No prior neurologic symptoms were noted. Axial, fat-suppressed, postgadolinium, T1-weighted image through the orbit reveals an intensely enhancing segment of the distal left optic nerve. A 43-year-old woman with acute vision loss and eye pain. No prior neurologic symptoms were noted. Coronal, fat-suppressed, postgadolinium, T1-weighted image demonstrates intense enhancement within the optic nerve. No significant nerve expansion or enhancement of the adjacent tissues is seen. Note the normal right optic nerve for comparison. A 35-year-old woman with acute onset of left-eye pain and vision decline. 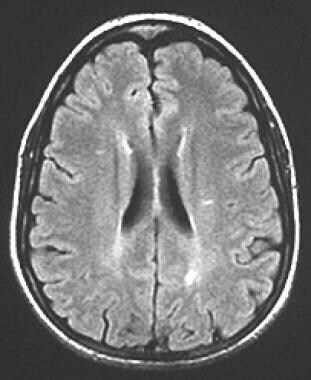 Axial, fluid-attenuated inversion recovery (FLAIR) image demonstrates bilateral periventricular white matter lesions. Several additional and similar lesions were seen in other locations (not shown). No history of prior neurologic illness was noted in the patient, but in the setting of acute optic neuritis, the multiple white matter lesions in a number and pattern atypical for the patient's age were considered to be supportive of the diagnosis of multiple sclerosis. Disability was also predicted by the presence at baseline of gadolinium-enhancing lesions and the number of infratentorial lesions. Only spinal cord lesions predicted disability in patients converting to clinically definite MS. Although not specifically relevant to optic neuritis, false-positive results in orbital imaging can result from failure of complete fat saturation related to magnetic susceptibility artifact from dental amalgam and air–soft tissue interfaces, particularly at the inferior margin of the orbit. This is true especially for frequency-selective fat-saturation techniques but less so for inversion recovery sequences. Fat-saturation failure can mimic orbital edema on multiecho-train, T2-weighted images or enhancement on fat-suppressed, T1-weighted images. Careful evaluation of the tissue surrounding the orbit should reveal the true cause of signal distortion. This artifact should not occur in optic neuritis, because the lesion of optic neuritis is confined to the nerve, but it can potentially mislead the interpreter to conclude that more diffuse orbital inflammation is the cause of vision loss. Occasionally, the enhancement pattern in optic neuritis is a peripheral tram-track pattern. 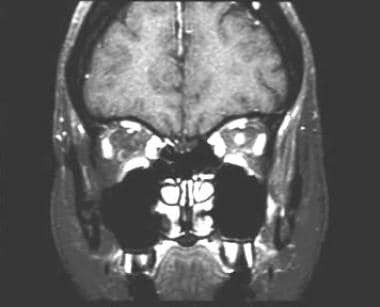 Potentially, this can be confused with the enhancement pattern of optic nerve meningioma. 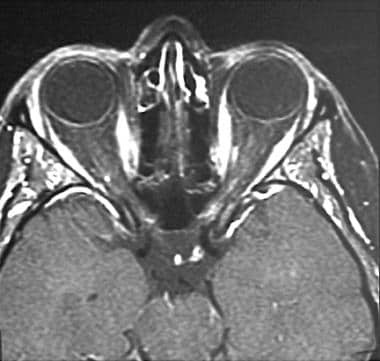 However, the optic neuritis pattern should be distinguished from the meningioma pattern by enhancement limited to the nerve, rather than the sheathlike pattern of meningioma; by the absence of significant mass or expansion; and by the clinical features of acute-onset vision loss and pain. Which imaging modalities are used in the diagnosis of optic neuritis? What is the role of MRI in the diagnosis of optic neuritis? 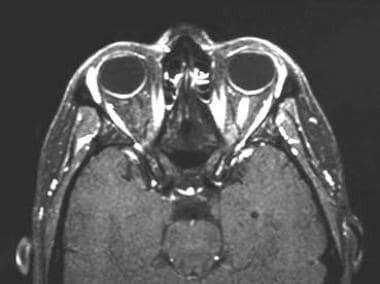 Which findings on MRI are characteristic of optic neuritis? What is the role of MRI in the diagnosis of optic neuritis in multiple sclerosis (MS)? How do brain MRI findings of optic neuritis affect the treatment of multiple sclerosis (MS)? What is the accuracy of MRI for optic neuritis imaging? Wilhelm H, Schabet M. The Diagnosis and Treatment of Optic Neuritis. Dtsch Arztebl Int. 2015 Sep 11. 112 (37):616-25; quiz 626. [Medline]. Osborne BJ, Volpe NJ. Optic neuritis and risk of MS: differential diagnosis and management. Cleve Clin J Med. 2009 Mar. 76(3):181-90. [Medline]. Mekhasingharak N, Laowanapiban P, Siritho S, Satukijchai C, Prayoonwiwat N, Jitprapaikulsan J, et al. Optical coherence tomography in central nervous system demyelinating diseases related optic neuritis. Int J Ophthalmol. 2018. 11 (10):1649-1656. [Medline]. Bonhomme GR, Waldman AT, Balcer LJ, Daniels AB, Tennekoon GI, Forman S, et al. Pediatric optic neuritis: brain MRI abnormalities and risk of multiple sclerosis. Neurology. 2009 Mar 10. 72(10):881-5. [Medline]. Mealy MA, Whetstone A, Orman G, Izbudak I, Calabresi PA, Levy M. Longitudinally extensive optic neuritis as an MRI biomarker distinguishes neuromyelitis optica from multiple sclerosis. J Neurol Sci. 2015 Aug 15. 355 (1-2):59-63. [Medline]. Zhang Y, Metz LM, Scott JN, Trufyn J, Fick GH, Costello F. MRI texture heterogeneity in the optic nerve predicts visual recovery after acute optic neuritis. Neuroimage Clin. 2014. 4:302-7. [Medline]. [Full Text]. Swanton JK, Fernando KT, Dalton CM, Miszkiel KA, Altmann DR, Plant GT, et al. Early MRI in optic neuritis: the risk for disability. Neurology. 2009 Feb 10. 72(6):542-50. [Medline]. Seeger A, Schulze M, Schuettauf F, Ernemann U, Hauser TK. Advanced diffusion-weighted imaging in patients with optic neuritis deficit - value of reduced field of view DWI and readout-segmented DWI. Neuroradiol J. 2018 Apr. 31 (2):126-132. [Medline]. Multiple sclerosis risk after optic neuritis: final optic neuritis treatment trial follow-up. Arch Neurol. 2008 Jun. 65(6):727-32. [Medline]. [Full Text]. Beck RW, Gal RL, Bhatti MT, et al. Visual function more than 10 years after optic neuritis: experience of the optic neuritis treatment trial. Am J Ophthalmol. 2004 Jan. 137(1):77-83. [Medline]. Costello F, Hodge W, Pan YI. Exploring the association between retinal nerve fiber layer thickness and initial magnetic resonance imaging findings in patients with acute optic neuritis. Mult Scler Int. 2011. 2011:289785. [Medline]. [Full Text]. Naismith RT, Tutlam NT, Xu J, Klawiter EC, Shepherd J, Trinkaus K, et al. Optical coherence tomography differs in neuromyelitis optica compared with multiple sclerosis. Neurology. 2009 Mar 24. 72(12):1077-82. [Medline]. Soelberg K, Specovius S, Zimmermann HG, Grauslund J, Mehlsen JJ, Olesen C, et al. Optical coherence tomography in acute optic neuritis: A population-based study. Acta Neurol Scand. 2018 Dec. 138 (6):566-573. [Medline]. Onodera M, Yama N, Hashimoto M, Shonai T, Aratani K, Takashima H, et al. The signal intensity ratio of the optic nerve to ipsilateral frontal white matter is of value in the diagnosis of acute optic neuritis. Eur Radiol. 2015 Nov 25. [Medline]. Chabert S, Molko N, Cointepas Y, et al. Diffusion tensor imaging of the human optic nerve using a non-CPMG fast spin echo sequence. J Magn Reson Imaging. 2005 Aug. 22(2):307-10. [Medline]. Trip SA, Wheeler-Kingshott C, Jones SJ, et al. Optic nerve diffusion tensor imaging in optic neuritis. Neuroimage. 2005 Oct 18 [Epub ahead of print]. [Medline]. Hickman SJ, Wheeler-Kingshott CA, Jones SJ, et al. Optic nerve diffusion measurement from diffusion-weighted imaging in optic neuritis. AJNR Am J Neuroradiol. 2005 Apr. 26(4):951-6. [Medline]. Jeantroux J, Kremer S, Lin XZ, et al. Diffusion tensor imaging of normal-appearing white matter in neuromyelitis optica. J Neuroradiol. 2011 Dec 13. [Medline]. Hodel J, Outteryck O, Bocher AL, Zéphir H, Lambert O, Benadjaoud MA, et al. Comparison of 3D double inversion recovery and 2D STIR FLAIR MR sequences for the imaging of optic neuritis: pilot study. Eur Radiol. 2014 Dec. 24(12):3069-75. [Medline]. Pino-Lopez L, Wenz H, Böhme J, Maros M, Schlichtenbrede F, Groden C, et al. Contrast-enhanced fat-suppressed FLAIR for the characterization of leptomeningeal inflammation in optic neuritis. Mult Scler. 2018 Apr 1. 1352458518770268. [Medline]. Heussinger N, Kontopantelis E, Rompel O, Paulides M, Trollmann R. Predicting multiple sclerosis following isolated optic neuritis in children. Eur J Neurol. 2013 Sep. 20(9):1292-6. [Medline]. Soelberg K, Skejoe HPB, Grauslund J, Smith TJ, Lillevang ST, Jarius S, et al. Magnetic resonance imaging findings at the first episode of acute optic neuritis. Mult Scler Relat Disord. 2018 Feb. 20:30-36. [Medline]. Buch D, Savatovsky J, Gout O, Vignal C, Deschamps R. Combined brain and anterior visual pathways' MRIs assist in early identification of neuromyelitis optica spectrum disorder at onset of optic neuritis. Acta Neurol Belg. 2017 Mar. 117 (1):67-74. [Medline]. Optic Neuritis Study Group. Visual function 5 years after optic neuritis: experience of the Optic Neuritis Treatment Trial. The Optic Neuritis Study Group. Arch Ophthalmol. 1997 Dec. 115(12):1545-52. [Medline]. Kaufman DI, Trobe JD, Eggenberger ER, Whitaker JN. Practice parameter: the role of corticosteroids in the management of acute monosymptomatic optic neuritis. Report of the Quality Standards Subcommittee of the American Academy of Neurology. Neurology. 2000 Jun 13. 54(11):2039-44. [Medline]. Arnold AC. Evolving management of optic neuritis and multiple sclerosis. Am J Ophthalmol. 2005 Jun. 139(6):1101-8. [Medline]. Jacobs LD, Beck RW, Simon JH, et al. Intramuscular interferon beta-1a therapy initiated during a first demyelinating event in multiple sclerosis. CHAMPS Study Group. N Engl J Med. 2000 Sep 28. 343(13):898-904. [Medline]. CHAMPS Study Group. Interferon beta-1a for optic neuritis patients at high risk for multiple sclerosis. Am J Ophthalmol. 2001 Oct. 132(4):463-71. [Medline].